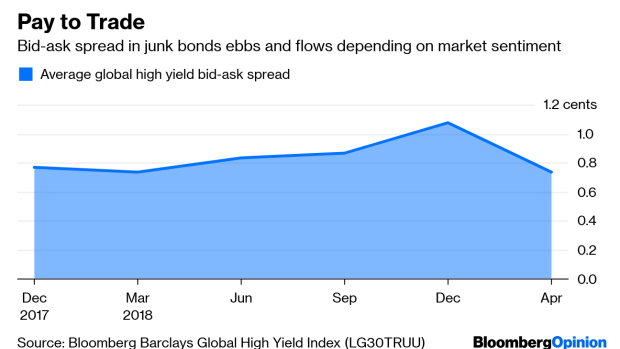 (Bloomberg Opinion) -- In a world in which everything is getting faster and more transparent, often at a breakneck pace, leave it to the corporate bond market to argue it’s time to slow things down and bring back some secrecy. The Financial Industry Regulatory Authority is proposing a pilot program that would give bond traders 48 hours before having to disclose large block trades to other investors, rather than the 15 minutes required under current rules. For Wall Street brokers and large mutual-fund companies that would prefer to exchange securities in bulk, but also in a way that doesn’t tip their hands, this initiative is an unmitigated victory. For other corporate-bond investors, the trade-off between liquidity and transparency isn’t so clear. Brokers and investment firms such as BlackRock Inc. and Pacific Investment Management Co. have long said that such rapid disclosure can make it harder for a dealer to offload securities it’s bought, because market participants know exactly what was bought and at what price. The idea for the pilot was suggested by a group of industry executives that advises the SEC. The Securities Industry and Financial Markets Association, Wall Street’s biggest trade group, has expressed support for the proposed test as did JPMorgan Chase & Co. and Eaton Vance, according to Finra. At the same time, the regulator said that two market makers for exchange-traded funds have expressed concern that the changes would reduce price transparency. For some longtime observers of bond markets, concern about a liquidity shortfall is always lurking. Indeed, there’s no question that post-crisis regulations have caused dealers to hold less debt on their books and have made them generally reluctant to step in and make markets during volatile times — precisely when investors need to get out of their positions. I happen to think that’s somewhat of a feature, not a flaw, with buy-side investors taking a massive price hit rather than banks taking on undue risk. Sokobin said that generally there’s evidence that disseminating more data is beneficial to markets. Finra’s pilot would test specifically if that’s true when data is kept private for 48 hours on trades of more than $10 million in investment-grade debt and trades greater than $5 million for speculative-grade bonds. Basically, this is all very vague. How much exactly is the “some amount” of trading that isn’t taking place? What precisely is a “fair return” for the broker? Are those block sizes appropriate, or too small to get extra privacy? No one knows, not even Finra, which is seeking public comment through June 11 on whether to go ahead with the plan. I say full steam ahead. By design, it’ll only last one year, which in theory should provide a range of market environments to study how the extra disclosure time changes the behavior of investors and brokers. The actual mechanics of the proposal, to be sure, are a bit wonky. For instance, after 126 days of trading, bonds initially in one of the test groups would be rotated to the control group, while those initially in the control group would be divided equally into the three test groups. This mechanic could alter expectations for the securities once they rotate based on how similar debt performed during the pilot. Simply put, things could get weird. That’s a price worth paying to bring some empirical evidence to the debate about bond-market liquidity. Dealers have an incentive to raise doubts among investors about how they’ll exit a position in a credit crunch. High-yield debt and investment-grade corporate securities have suffered losses time and again but lacked any true liquidity crisis. As I wrote earlier this month, fixed income is making progress in getting with the times and shifting to electronic trading. There’s not really an excuse anymore; not with at least 128 U.S. corporate-bond exchange-traded funds providing nearly real-time pricing. I believe it’s still hard to trade big blocks of bonds, but that’s at least somewhat offset by the range of new tools to determine fair value. Wall Street bond dealers have long been squeezed during this march toward progress. This potential pilot program might just be their last chance to prove their worth and justify slowing down the sprint toward computerized trading.